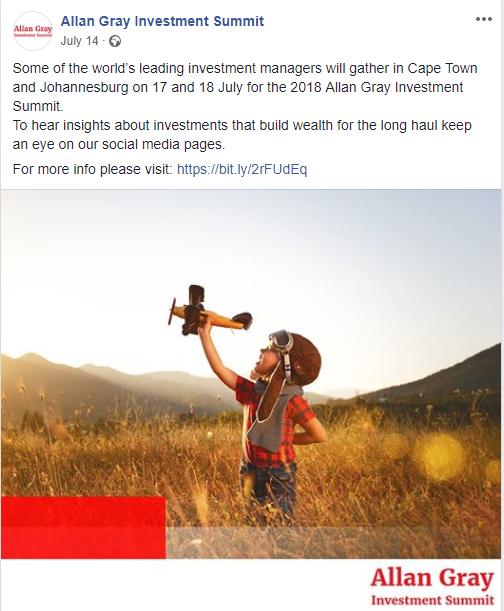 In 2018, Allan Gray took their annual Investment Summit digital by launching social media profiles and a social media campaign. Event specialists, Thundermark, approached The Social Media Company to assist with this initiative. The main focus of the Allan Gray Investment Summit campaign was to sell tickets for their events hosted in Sandton and Cape Town. What initially started out as a content creation project, quickly turned into a fully-fledged social media campaign, including paid ads and video. The top source of traffic for the Allan Gray Investment Summit website during this period were their social media channels. Both the summits completely sold out in record time. The 2018 Allan Gray Investment Summit is taking place tomorrow at the Cape Town International Convention Centre and at Sandton Convention Centre on Wednesday. Keep an eye on our Facebook page and Twitter profile for updates from the Summit.